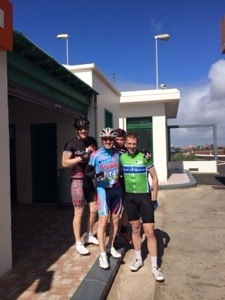 I can’t believe how quickly the first 3 days of our training camp here in Lanzarote have gone! It’s been a hard block. Day 1 was a 4 hour ride with a threshold effort up the climb at Tabayesco; Day 2 was 5 hours which included 2 x 40 min tempo efforts in small groups followed by the brutal climb up to Femes; Today was an endurance ride of almost 6 hours covering 95 miles and 7,500ft of climbing. Day 1 I didn’t feel great, but got through it. I loved day 2 – it was one of the best days I’ve had on the bike, but today I suffered like a dog. I got through it thanks to cans of Pepsi, energy bars & gels and most importantly the wheel of Davie Lines. Tomorrow is a rest day, with a one hour cafe ride – I may treat myself to a wee cake. In the afternoon I’ll have a chat with Gary about my race plan for the first part of the season. Then it’s block 2, which promises to be tough. But I’m not thinking about that tonight, I’m just stretching and thinking about that coffee & cake tomorrow.